and the offerings were expanded. Recent year Magic ornaments include combinations of light, motion and music. Many are battery operated while others plug into strands of miniature tree lights. Some Magic ornaments even wind up - winding the ornament makes the figures move or the music play! Over the years light strands have changed, making it sometimes difficult to match up a Magic ornament with a light strand. Light Strand Adapters or Legacy Cords are often needed for the older 'light strand' ornaments. Most Magic ornaments work perfectly for many, many years. Should repair be needed, it is best to just replace them, as we are unaware of any repair service. Magic ornaments often become family favorites offering years of fun...ENJOY this Magical addition to your ornament collection! 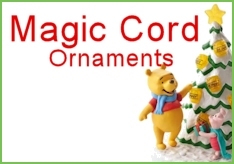 The most recent addition to the Hallmark Magic ornament line are the new "MAGIC CORD" ornaments. Introduced as Wonder and Light in 2010 these ornaments are powered by a special "Magic Cord." All ornaments plugged into the same power cord can display a synchronized sound and/or light show. Click on any of the Magic ornaments for detailed information about what makes it "Magic" and how it operates. Battery Guarantee: Hallmark Magic Ornaments are shipped with NEW batteries. We replace the batteries in the older ornaments, so you don't have to!